For those that cycle in and around Lewes, please share your experiences and thoughts for an updated cycle map. Don’t despair, help is at hand. 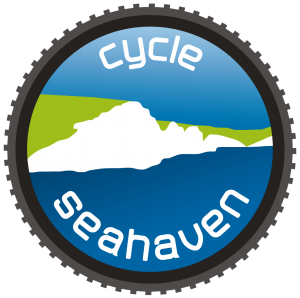 Cycle Seahaven has produced a video guide to help you to plan new routes. It gives you the skills and tools you will need to explore many exciting new routes and find parts of the countryside you never knew existed. When you’ve planned them, recce’d them, and proved them with a group, why don’t you put them on our website where you will find nearly 20 others with maps and directions. Find them at “Rides and Events”, “Cycle Routes”. One of the key elements of the Monday daytime rides is that we seek to use bridleways, byways and quiet country roads, with as much off-road as possible, sometimes over 75% of the route. Most of the bridleways and byways would have been in existence from the time of the enclosures, if not earlier, and were the usual means for farmers and labourers to access fields and villages and for villagers to get to church. They are very irregular in direction and, when converted into roads, give rise to the famous “rolling English roads”. Those that were not made into roads, remain as unsurfaced byways (open to wheeled traffic), bridleways and footpaths. Part of our vision is to seek out and use these routes so that they do not disappear through neglect. Full details of all rights of way can be found on the East Sussex Rights of Way website and on any Ordnance Survey map. 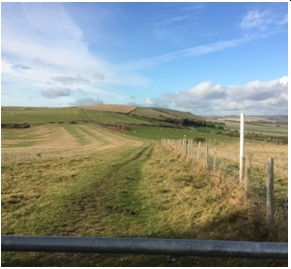 There are many bridleways on the South Downs giving access to wide open vistas and bracing fresh air. They are usually firm, grassland tracks, sometimes stoney, with gentle slopes or very steep hills. Down in the low Weald, they are more secluded, tree-lined and calm with dappled sunlight peeking through the branches. They are flat or have low hills and in places suffer from deep puddles or stretches of cloying mud. One of the major problems we have experienced is the degradation of these routes. We have found that access to the wide range of routes is being restricted by problems at several, usually narrow, key nodes or pinch points which are difficult to negotiate particularly for less adventurous cyclists, walkers and riders and those with younger families. 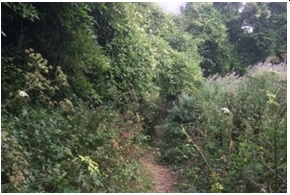 The overgrowth in summer of nettles, brambles, hawthorn and other vegetation which render the use of the route unpleasant or dangerous. Two of the group recently emerged from such an overgrown path streaming blood from bramble scratches. Even when the ground may have been cleared of vegetation, overhanging hawthorn and bramble can cause serious injury to equestrians and cyclists. A good (bad) example is on the path to Bopeep at the top of the Golf Course. Whether it is increased use or increased rainfall, a number of bridleways are suffering from severe erosion, even on chalk. This renders them difficult negotiate as deep V-shaped gullies are created with loose rocks in the bottom, sometimes leaving no level surface. These may be sufficiently deep to catch pedals and throw off riders. 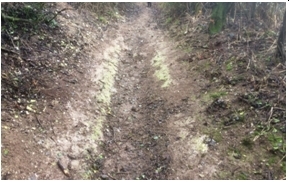 An example is the upper part of the bridleway in Poverty Bottom. Areas of deep mud remaining all year which, in narrow sections, leave no dry area to bypass, in others, deep puddles extending across the width of the track or a series “poach holes” up to 15cms deep where hoofs have sunk into the mud. These are often in gateways and near streams. 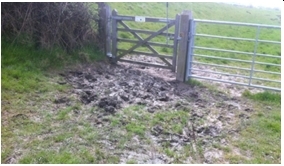 A particularly bad example is the bridleway from Bates Green Farm west of the Cuckmere River. Byways are open to wheeled vehicles, and tractors, 4x4s and motorbikes can cause serious problems. Wheel tracks, sometimes three across the byway and up to 20 cms deep, leave only a narrow and discontinuous pathway between. An example would be the track to Folkington from Wilmington. Byways may be closed in winter but this does not apply to cycles. All paths get overgrown in summer, most paths get wet and muddy in winter, but a few key places are getting to the point where they are unusable all year and are restricting access to a large network of adequate routes. The main point is that these are small areas that are restricting access to a much greater length of excellent bridleways and byways which could provide exercise and interest to many. It should be possible for remedial action to be taken to remove these problems and improve access to all parts of the network. Another point is that these pinch points force users onto a few easier paths which may, in turn, become overused and suffer erosion. According to ESCCs Rights of Way Team, it is the landowners’ responsibility to maintain Rights of Way across their land. The Team advise that if you find a problem on a Right of Way, report to them, quoting the number of the route. This can be found from the on-line Rights of Way Map by clicking on the route at full magnification when a drop down box will show the Parish and number of the route, even of each stile and gate. With traffic on the roads increasing, it is essential that these off-road routes are used and not lost. A new page has been added to our website that lists a small selection of our favourite rides. The list can be sorted by mileage or total climb so you can look for routes by distance or effort. You can use the search function to filter routes by destination, distance or type (Road, MTB, Track). A link to an online map is also provided, allowing you to try out these routes on your own, or to get a good feel for the ride before you join us. We plan to increase this list to include more routes. If you have a favourite route that’s not listed then please let us know. If you’re looking for a new cycle route then online maps can help you avoid the traffic and take you to some interesting places. At the moment they are no substitue for a proper printed map (or a helpful guide/ride leader, who can also fix punctures), but they can certainly spark interest in where to go next. There are a number of free online maps that you can use to help you decide on a route, so here is a selection of some of the ones I’ve used. Google Maps has a number of display modes including Aerial photo (Satelite), road map and also has an excellent option to include ‘Bicycling’ routes. This includes Trails, Cycle Friendly roads and dedicated cycle routes. 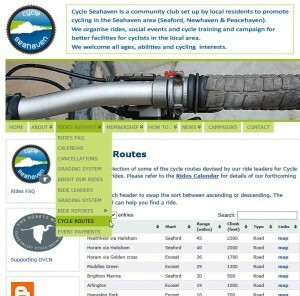 You can also plan a cycle ride from point to point using cycle friendly routes then save and share a copy via email (Clive does this for most of his rides). Printing the map falls short of ideal when venturing off-road. The map willl show the route in relation to highways and towns, but will it not show O/S style features or paths, thus making it quite useless for off-highway excursions. StreetMap has a range of OS maps at different scales that are free to browse. You can print a very small section with OS detail for free, but not enough to be useful when you’re out on your bike. Bing Maps is Microsoft’s own offering, and like Google it has Satelite and Road Map options. But unlike Google it drops the ability to see cycle friendly routes in favour of an excellent O/S option. Like Google the printed version is a basic road map and you lose the OS overlay that is important when venturing off road. Ordnance Survey provide superbly detailled maps that are invaluable for the off-road explorer, and their online ‘Get a Map’ service is a free way to get a piece of the action. A half-page a4 O/S map is free to print, and might just about be enough if you know most of the route but need a little help on a small section. Anything larger is by paid subscription or one-off fee. ESCC RoW maps use a combination of O/S maps overlayed with Rights of Way data that make new routes very easy to find. For cyclists it’s very easy to see Bridleways and Byways, along with Stiles, Gates, Bridges and planned closures. There’s no print option, but it’s a great way to discover what’s out there. 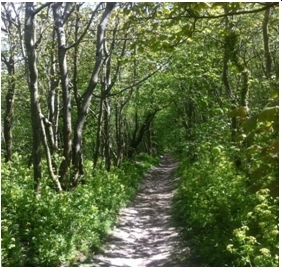 Friston Forest has a great network of trails for families and the more experienced off-roader. There are many unofficial trails in the forest, so we recommend you take care when following trails as you may come across jumps and other trail features. If you are serious about electronic mapping then you may consider paying for the priveledge. Memory Map provides PC, tablet and smartphone software for O/S mapping. You can define and download your own maps, plot routes and upload/download to and from most GPS devices. Ordnance Survey have a similar service to Memory Map, but it’s all done online. Dedicated cycle-specfic GPS devices have been available for a while from companies such as Garmin and Memory Map. These fit onto your handlebars; some provide a map with a ‘you are here’ pointer to make navigation easier, while others simply remember where you’ve been and how fast you were going. Smartphones are often very capable GPS devices with free apps such as Strava, Endomondo, MapMyRide, and many more. Free versions can be upgraded to paid-for version for improved functionality including navigation. Most of these apps don’t require a data connection for basic functionality, so you shouldn’t rack up any additional data bills. If in doubt then check with the developers or disable data on your phone. Battery life may suffer when running these apps. To preserve battery life try turning off WiFi and any data hungry features you don’t need. A GPS device on your bike can give you basic information like speed, average speed, total height climbed and distance, but they come into their own when coupled with mapping software. This software lets you review the route you took and lets you share it with others. Some also compare your ride with the last time you took the same route, so you can see if you’re getting quicker or are having a bad day. Many allow you to ‘race’ against others over defined ‘segments’, placing you on a leaderboard with all other riders with the same app. For worry free navigation when you’re on your bike you can’t beat a paper map, ideally laminated or printed on plastic for proof against the rain and hard use. They don’t run out of batteries and there’s no problem with small screens. But they do get out of date, and may not show the latest rights of way. If you have a favourite mapping application that’s also free then we’d love to hear about it.